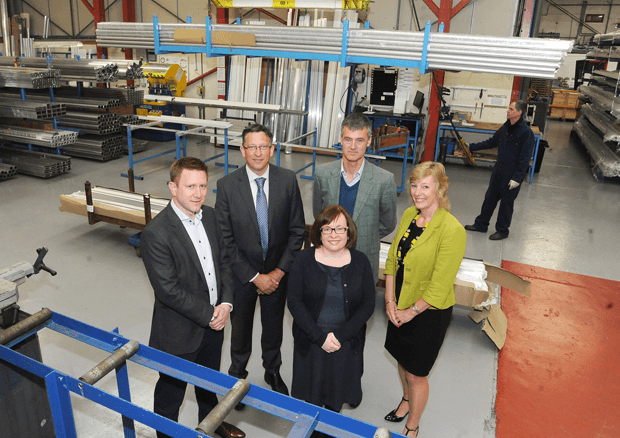 Two high-end Warwickshire manufacturing companies have won vital backing in their plans for expansion. Guthrie Douglas, a world-leading manufacturer of tension blind systems based in Warwick, and NEJ Stevenson, a designer and maker of fine furniture based in Church Lawford near Rugby, are both investing heavily in their future and have received support through the Business Ready programme. Guthrie Douglas is ploughing significant investment into its growth plans to more than double its turnover in the next four years, which will see the company increase its staff headcount to 20. Part of that plan is the purchase of a new machine that will allow the company to make more parts in-house and has received a £35,000 grant through Warwickshire County Council to buy the equipment. Likewise, NEJ Stevenson, which has a Royal Warrant for its products and has made furniture for, among others, the Duke and Duchess of Cambridge, has doubled in size in two years and needs to grow further. It is extending its current base in Long Lawford and is also buying new machinery. It has received a grant of £35,000 towards the costs through Warwickshire County Council. In both cases, the funding is supporting the companies to grow more quickly, create new jobs and help to drive the manufacturing sector in the region. Andrew Kitching, of Guthrie Douglas, said: “The grant is a huge help and will, genuinely help us to grow the business. It will allow us to develop a new product range and will bring great improvements for existing customers as well as helping us push into new markets. “We already sell to over 40 countries, exporting 85 per cent of what we make, and this grant, along with our own investment, means we can grow more quickly. Business Ready delivered by the University of Warwick Science Park and is part of the Coventry and Warwickshire Business Support Programme, which is part-funded by the European Regional Development Fund and Warwickshire County Council. Neil Stevenson, of NEJ Stevenson, added: “It’s simply stunning to get this level of support. To be perfectly honest, we’d given up on grants because over the years we have applied and have found it very difficult or just didn’t qualify. “This grant, through Warwickshire County Council, was much more user-friendly and will help us to grow. Janette Pallas, of Business Ready, said: “Guthrie Douglas and NEJ Stevenson are great examples of some of the high-end, high-quality manufacturing going on Warwickshire. “They supply to everyone from royalty to museums and are renowned for the quality of their manufacturing.